The 138th edition of the iconic Stawell Gift takes place at Central Park in Stawell, VIC on April 20-22, 2019 and will feature a $94,000 prize pool. The feature 120m Open Gift and 120m Women’s Gift will each carry a $25,000 prize pool with the winner of each event taking home $17,000, with the prize pool paying down to fourth place in each final. The Stawell Athletic Club recognises that the prize pool for the 2019 event is reduced from recent years and has been a decision not made lightly by the Stawell Athletic Club Committee. 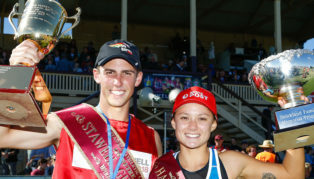 “Commercial sponsorship of the Stawell Gift carnival has been difficult to realise in recent years as a committee we have had to make a difficult decision regarding a reduction in athlete prize money as one of the means to making the event financially sustainable and ensuring its future,’ said Stawell Athletic Club President, Darryle Harrison. The Stawell Gift is broadcast live on the Seven Network on Easter Monday. The 2018 television program delivered $2 million of gross media value to sponsors and the event itself contributes more than $4 Million in economic impact to the region. “We continue to work with prospective commercial partners and Government on opportunities to invest and support the Stawell Gift in light of the value that the event delivers to partners and business in the region. If the opportunity presents itself through commercial support the Stawell Athletic Club will consider increasing prize money levels as appropriate for the 2019 event,” said Harrison. Tom Burbidge, CEO of the Victorian Athletic League emphasises the significance and importance of the Stawell Gift to Australian sport and the running community. “As the pinnacle of pro running in Australia, the Stawell Gift holds a special meaning for so many people. The event is the cornerstone of professional athletics and its story is synonymous with Australia’s unique and proud sporting history. The VAL continues to support the Stawell Athletic Club in its endeavours to conduct this iconic event”. Entries for the 2019 Stawell Gift Carnival, and full details on prize money for all events is now available on the Victorian Athletic League website at www.val.org.au.